In early 2014, Rowden and Leizel decided that they would get married this upcoming July. Shortly after making that decision, Rowden was unexpectedly diagnosed with stage IV liver cancer. 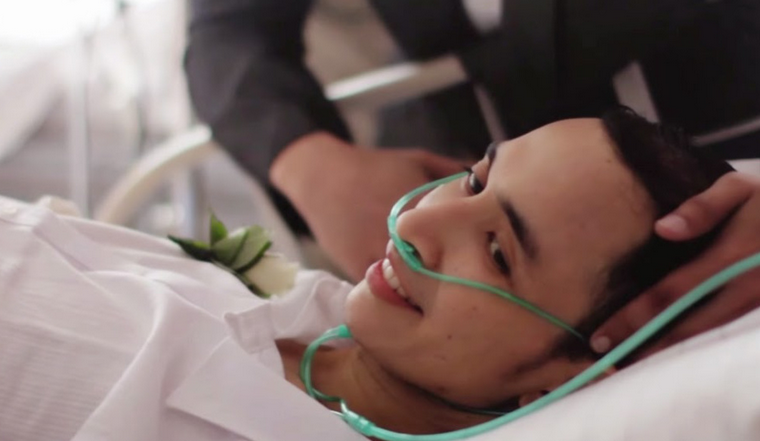 Unable to leave the hospital, it became clear to the couple that the thought of Rowden making it to their wedding day was more than wishful thinking. Not wanting Rowden to leave this world without having married the love of his life, his friends and family worked together with the hospital to bring the ceremony to him. It took 12 hours of preparation, but they were able to do it–and, oh, what a ceremony it was. Rowden died less than ten hours later, leaving behind his wife Leizel and their 2-year-old daughter Zakiah. While he is no longer physically with them, they’ll always have this moment to look back on. I thought so too, Laurie. I agree. Have a great day !! So touching Theresa, a loving way to say goodbye. Very touching. A tragedy, and at the same time brings up the best of humans. Connections and relationships… often invaluable and inseparable. Life can change in a minute Theresa cherish every moment and this one was beautiful yet so sad. Beautiful..I guess this is what love is…Thank you for sharing..